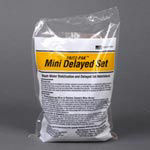 No need for admixture dispensers because Mini Delayed Set is packaged in a patented water-soluble Fritz-Pak inner bag for convenient use at the plant or job site. 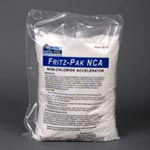 Fritz-Pak NCA is a non-chloride accelerator in powdered form. It is packaged in water soluble bags for easy addition to concrete ready mix trucks. It shortens set times while increasing early compressive strength. Fritz-Pak NCA does not contain calcium chloride or any other materials that promote corrosion in steel. NCA can be easily stored for use as needed. Acceleration is dependent on the dosage used. NCA is packaged in a patented water-soluble Fritz-Pak inner bag for convenient use at the plant or job site. Fritz-Pak NCA is a non-chloride accelerator in powdered form. It is packaged in water soluble bags for easy addition to concrete ready mix trucks. It shortens set times while increasing early compressive strength. Fritz-Pak NCA does not contain calcium chloride or any other materials that promote corrosion in steel or efflorescence in concrete. Unlike some other non-chloride accelerators, such as those containing calcium nitrite, Fritz-Pak NCA is not hazardous. No special handling, storage or transportation expense is required.